Entrance of a house is the pathway of inflow of health and wealth and it is said in Vedas that entrance of house is symbolic of Rahu and exit door is of Ketu. Therefore entrance of any property should be made in such a way that it attracts money and for this Vastu recommends installing a huge entrance door and clean entrance surrounding in the house. Vastu retort that a property should never have doors in one straight line nor should they have same dimensions. 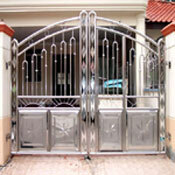 Accordingly, spacious entrance ensures good inflow of wealth and prosperity thereby preventing its outflow. It is also recommended to have small exit door in comparison to entrance door which should be large. In case exit or rear door is large then place a copperstrip across the breadth of the door 3 to 4 inches below.